The Loewe AirSpeaker has been on the market for a little while now, but at the recent IFA Global Press Conference in Sardinia, the German manufacturer was on hand to show it off. Airplay compatible speakers aren't uncommon, but Loewe is a premium brand in the world of home electronics, and the AirSpeaker is no exception. As you might expect from a premium product, good design is at the forefront. The AirSpeaker is supposed to look good in the home, as well as provide killer sound. There's no docking solution either, as the name implies, the AirSpeaker relies solely on Airplay. There's actually very little in the way of anything at all on the exterior. The rear of the unit houses the only 4 buttons along side the power cable which sits at the bottom, slightly recessed. Otherwise, it's all speaker. Sadly, it wasn't possible on the show floor to get a good demonstration of the sound quality, so it remains an eyes on only. As a premium product, it also comes with a premium price. In the UK one of these will set you back a pretty hefty £499.99. That's a lot, whichever way you look at it, but then the AirSpeaker is a high end product. The AirSpeaker wasn't the only thing at the event of note from Loewe, though. 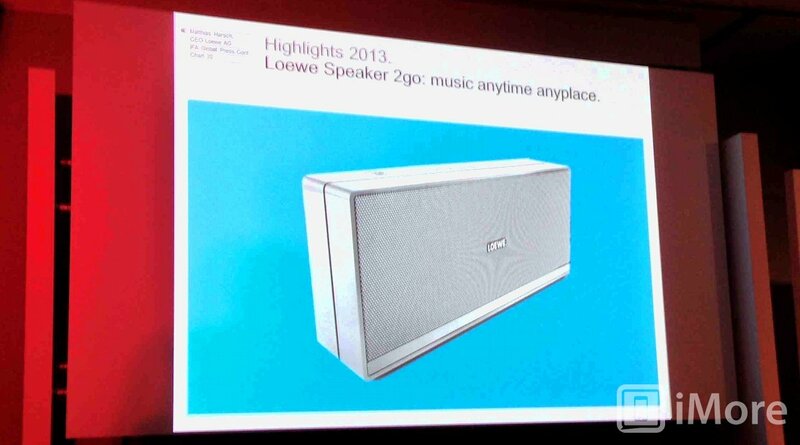 During their press briefing they teased a forthcoming portable speaker system -- the Loewe Speaker 2go -- that will have Airplay as one of its streaming options. A release timeframe wasn't provided, but since the event was linked to the annual IFA show in Berlin, it's not unreasonable to think we might see it there in September. It's a lot of money to spend on a speaker, but these sit nicely at the high end of the market alongside the offerings from Bowers & Wilkins. So, anyone interested by either of these? Be sure to share your thoughts with us in the comments below.